On Sunday evening, this year’s Brazilian championship reaches its half-way stage. Cruzeiro currently lead the way with 37 points, four clear of their nearest rivals. Regardless of their result against Flamengo this weekend, the Minas Gerais side has already won the symbolic title of “campeão do primeiro turno”, or first term champions. Although there is no trophy or financial reward for being on top of the league after 19 matches, in Brazil, the “winner” of the first term usually ends up holding on to their place come the 38th round. In fact, in the last ten editions of the Brasileirão, seven of the first term champions have gone on to win the trophy. It is not by chance that Cruzeiro are in front. They play some of the most attractive football in the country and have one of the most talented squads to back that up. Since Marcelo Oliveira (a forward for Cruzeiro’s bitter rivals Atlético-MG in the 1970s) took charge in January, he has implanted his successful playing style and tactical system: a 4-2-3-1 built on constant movement and quick passing triangles. This approach brought good results during Marcelo’s two years at Coritiba and now with a more talented group of players at his disposal, the Belo Horizonte-born coach is finally getting the recognition he deserves. 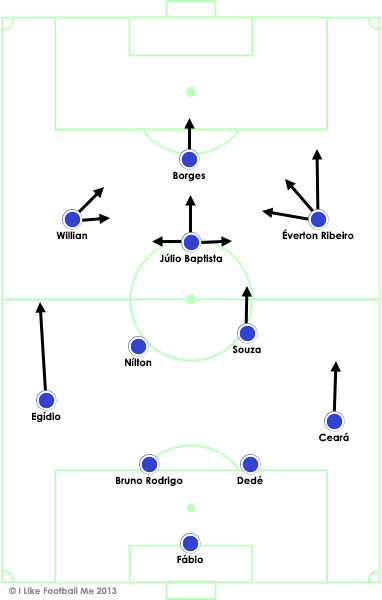 One impressive quality of this Cruzeiro team is the vast number of options they have in attack. For the line of three behind the centre-forward, there are nine relevant players able to occupy the three positions. Éverton Ribeiro, Dagoberto, Luan, Martinuccio, Willian, Lucca, Élber, Ricardo Goulart and Júlio Baptista. Their team is missing a craque to organise the play and serve as an attacking reference, like Seedorf at Botafogo or Alex at Coritiba, but by that same token they are not over reliant on one player to make the team tick. There have been some defensive troubles, however. Since joining from Vasco, centre-back Dedé has struggled to regain his form and has made several high-profile errors, while his defensive partner Bruno Rodrigo is little more than an average stopper. The real issues appear to be in midfield, where first-choice pairing Nílton and Souza have only started together in half of Cruzeiro’s matches. When they are at full strength, the team looks solid and rarely concedes, but substitutes Leandro Guerreiro and Lucas Silva are not up to the job, as they demonstrated at home last weekend by allowing Vasco to score three times. The only other team that looks genuinely equipped to challenge Cruzeiro is current world champions Corinthians. The Timão made a slow start to the national championship, but have now lost only one of their last eleven league matches. While his starting eleven has been more or less constant for the last two years, Corinthians coach Tite has been varying his tactics a lot this year, trying to find a suitable balance in the wake of bellwether midfielder Paulinho’s departure to Tottenham Hotspur. Their defensive solidity has remained however, thanks in part to the signing of former Cruzeiro centre-back Gil from French side Valenciennes. Corinthians have the most secure defence in the league by some distance, conceding only eight goals in eighteen matches. The second best defence is that of Santos, who have conceded fourteen goals after playing two fewer games. Antithetical to the league leaders, Corinthians have been responsible at the back yet shy in front of goal. At times they seem content to stay strong in defence, getting bodies behind the ball, hoping that they can win the match on a stray counterattack or set-piece. This approach has worked for them before, namely in the 2012 Copa Libertadores and Club World Cup final against Chelsea, but when you are inviting pressure and not creating many chances it becomes an ineffective way to play. Alexandre Pato has yet to live up to the expectation of being the most expensive signing by a Brazilian club, but at the very least Corinthians have got him playing and injury-free, something Milan were never able to do. Pato is a strange case, in that he is regarded as an elite centre-forward without having done anything in his career to properly merit such a status. Fame and his lengthy injuries have contributed to this, making us see something that was never there. Behind Cruzeiro and Corinthians, there is a small group of outsiders comprising Botafogo, Grêmio and Atlético-PR. Botafogo started the season extremely well, playing a modern, attractive style of play led by veteran playmaker Clarence Seedorf. The surprise departure of Vitinho leaves them a little sluggish in attack though, they will miss his direct threat. 21 year-old Hyuri made his debut for the club on Thursday night against Coritiba, scoring twice in a 3-1 win. I don’t know much about the player, who joined the club on loan last month from Audax after an impressive state championship campaign, but Botafogo’s knowledgeable coach Oswaldo de Oliveira seems to believe Hyuri has what it takes to fill Vitinho’s absence. Time will tell. Renato Gaúcho has made a good start to his time at Grêmio, as has Vagner Mancini in charge of Atlético-PR. Both teams are organised and on a good run of form, Grêmio playing a 3-5-2 system that focuses on width and attacking support from their wing-backs, while Atlético have constructed a dangerous attacking unit, with plenty of speed and off-the-ball movement, spurred on by the evergreen Paulo Baier.